[171 Pages] High temperature plastics are those plastics that are used in applications with high temperature requirements. HTPs are generally classified as specialty plastics due to their limited use and high cost. These plastics are produced in very low quantities due to their nature of application (less than 1% of whole plastics market). HTPs also provide chemical stability and high mechanical properties at high temperature range. The general temperature range for use of HTPs is 1500 Celsius and above. The high temperatuire plastics market is expected to reach $13,317.95 Million by 2019. The global high temperature market has been growing rapidly during the last few years. The market is expected to continue growing at a healthy rate in the next five years, mainly driven by a growth in the end-user industries such as automotive and aerospace industry. Asia-Pacific is the largest market for the high temperature plastics, the region accounted for 46.7% of the global HTPs market demand in 2014. The high growth in automotive and aerospace industry, complemented with shift of manufacturing hub from western regions to the Asia-Pacific is the major driving force for HTP market is Asia-Pacific North-America is the second largest market for HTPs, followed by Western Europe. The major growth factors attributing to growth of HTPs market in North America is high growth of aerospace industry in the region, whereas in Western Europe the major drive is stringent regulations in automotive industry. This study estimates the global HTPs market for 2014 and projects the expected demand of the same by 2019. This market research study provides a detailed qualitative and quantitative analysis of the global HTPs market. It also includes a comprehensive review of major market drivers, restraints, opportunities, winning imperatives, challenges, and key issues in the market. The market is further segmented and forecast based on major regions— North America, Europe, Asia-Pacific, and Rest of the World. Various secondary sources such as encyclopedia, directories, and databases have been used to identify and collect information for this extensive commercial study of the HTPs market. The primary sources, experts from related industries and suppliers, have been interviewed to obtain and verify critical information as well as to assess the future prospects of the market. Competitive scenario of the top players in the HTPs market has been discussed in detail. The top players of the industry are profiled in detail with their recent developments and other strategic industry activities. These include Solvay S.A. (Belgium), SABIC Innovative Plastics (The Netherlands), E. I. du Pont de Nemours and Company (U.S.), Celanese Corporation (U.S.), Victrex plc. (U.K.), and others. Scope of the report: This research report categorizes the global market for high temperature plastics on the basis of types, end-user applications and regions along with forecasting market size in terms of value, and analyzing trends in each of the regions. On the basis of region: The global HTP market is segmented into four regions; North America, Europe, Asia-Pacific, and Rest of the World. High temperature plastics are growing to play an important role in the transportation industry. In this industry, there is a growing demand for high-performance and lightweight materials. To meet this demand, high temperature plastics are being used to produce various interior, exterior as well as under-the-hood components. This demand is further boosted by implementation of stringent environmental regulation in regions like Europe and North America. The increased use of high temperature plastics, in various end-use industries, is a result of their wide array of properties. This increased demand of high temperature plastics in key end-use industries is a major driver for the market. Additionally, the use of high temperature plastics to replace conventional materials including metal, ceramics, and other traditional plastics is projected to fuel market growth. Also, the intensive investment in R&D by various market players to innovate and develop new products and applications has also resulted in robust demand in the high temperature plastics. 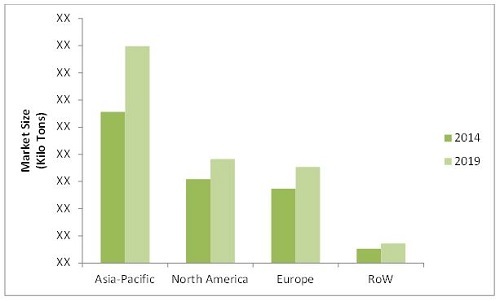 Asia-Pacific and North America are the top-two consumers of high temperature plastics in the world. China and the U.S. are key countries in Asia-Pacific and North America regions respectively growing at CAGRs of 7.9% and 4.3% between 2014 and 2019. Some developing countries such as India and Brazil are also growing at a rapid pace because of the rising domestic demand. The high temperature plastics market is estimated to be worth 595.94 kilo tons in 2014 and is projected to reach 803.55 kilo tons by 2019, growing at a CAGR of 6.2% between 2014 and 2019. Key participants in the global high temperature plastics market include Solvay S.A. (Belgium), SABIC Innovative Plastics (The Netherlands), E. I. du Pont de Nemours and Company (U.S.), Celanese Corporation (U.S.), and Victrex plc. (U.K.).